Bioinformatics. Personalized medicine. Sequenced microbial genomes. Progress in gene therapy. Improvements in nutrition. Making sense of these advances in biomedical science and of the knowledge explosion in domains such as genetics, drug design, neuroscience, and environmental health requires both a sophisticated understanding of biological questions and powerful analytical tools to solve them. The integrated discipline of computational biology/bioinformatics represents the application of modern computer science, statistics, and mathematics to exploring biological and biomedical problems. The Department of Biological Sciences in the Mellon College of Science and the Computational Biology Department in the School of Computer Science combine their world-class strengths in computer science and biology with the strong tradition of interdisciplinary research at Carnegie Mellon into a unique training program in this emerging field. The M.S. in Computational Biology program enrolls students who desire a more immediate career in industry or who wish to explore computational biology without committing to a doctoral program. It also draws returning professionals who seek to enhance their skills and practices in this new interdisciplinary field. Coursework consists of Foundation Courses, Background Courses, and Breadth & Depth Courses in a wide array of disciplines such as computer science, machine learning, math, statistics, biology, chemistry, biomedical engineering, and information management. 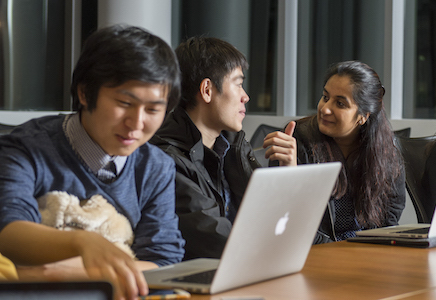 Students have the option of conducting in-depth research in addition to coursework, and are also encouraged to seek external internships after their first year. Students pursue this degree full-time and complete the program in 3-4 semesters. Students who have completed the program have gone on to work in a wide range of industries in biotech and pharma as well as goverment and academic institutions. Recent graduates have been employed at companies and institutes such as the J. Craig Venter Institute, Thermo Fisher Scientific, Philips Research, and Broad Institute of MIT and Harvard, to name a few. Other graduates have gone on to pursue Ph.D. degrees at a number of top universities around the world.